After 4 years on the water, we finally made it to Brazil. We had an awesome time on our hometown ''Canela'' and now everybody is moving on with their lives. Gustavo is living in Belgium with his girlfriend Kaya. Little John is living in Canela and working as a biologist in an ecological park. Claudio is living and working in Canela with his wife and daughter. Bruno now owns a small hotel near Canela. Rasta is back in New Zealand. As for me, I am trying to sell the boat so I can get my yachtmaster licence. If everything goes as planned, that should happen on the next 2 months. 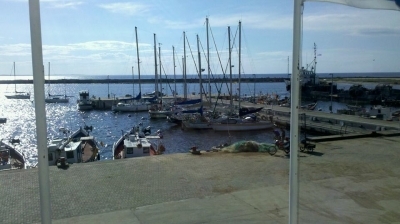 About the boat, we are asking USD110.000,00 and the boat is in Uruguay. Whe knows us must imagine the size of the party on our arrival, and thats why it took so long to update the website. We first arrived in Rio, a special place to arrive by boat, because of it´s awesome lanscape. The 4 days we spent there were already cool but the best was still coming. From there we flew on a small airplane (Cesna 310) to our home town and when we arrived the airport runway was filled with friends and family. We expected it to be special but that was amazing. From there it started a party marathon, with the peak being on our lake house. There we had our friends bands playing and 2 generations having fun together, a moment to remember. The plan now is to spend new years here and on the beggining of january fly to Rio to go get the boat, the ideia is to bring it to Porto Alegre, the capital of our state. The day has come, it is time to leave, it is time to go back home! We thought about this day many times in diferent ways. Thinking about this day sometimes gave us that good feeling of butterflies in the stomach just by thinking of being back home, sometimes the butterflies in the stomach were kind of a nervous feeling cause the trip is coming to an end. We will have approximately 30 days to play with those feelings. 30 days at sea. We used to have 30 days vacation in a year. I know that the brazilian Amir Klink spent 100 days rowing from Africa to Brazil alone, that Montesieur sailed around the world twice in almost 2 years without stopping, alone too. But we like to see people, land, and even with the company of friends, these 30 days will be long, full of anxiety to arrive, full of thoughts of how our life will be back in Brazil, how it will be like to see the face of our parents and friends waiting for us at the port. We will keep the website updated with our daily news, follow us and we hope to see you soon! As usual, we are a little bit late, but once we have more than 3.000 miles ahead of us, it is better to have everything ready. During the last days we sorted out a few important things. Yesterday we manage to change our water pressure pump which we bought in Richard`s Bay but stopped working after a few days. We also found a wire that we`ve been looking for a long time to fix the wind vain. We also did half of the shopping we need to do cause it would be impossible to do it in one go. Buying food for 4 guys for a 30 days passage is a lot of food. Another thing we have to fix is the alignment of the shaft that is vibrating a lot since one of the mountings of our engine broke during the crossing from Madagascar to South Africa. The mount was fixed, now we have to align the shaft properly which is not an easy job, so there is a mechanic helping Gustavo with it. Our ETA is still the 15th Dec. but since we are sailing, it might change. Follow us during the trip through the global tracker. It has been a while, but here we are to tell you what's going on with us. To begin with we made it to Simon's Town, a small city 1 and a half hours by train south of Cape Town. We will be here probably untill next week, since this weekend we will have the visit of Phill, the first owner and the guy who built Canela (Golovan). Mean while we have been preparing the boat for the big crossing of the atlantic ocean as well as getting to know a little more about this part of the country, which is amazing by the way. Last weekend we went to Cape Town and stayed on a backpackers. It was good to be on that vibe again, way diferent from the yachtClub. We had the visit of our friend Dean, met our dutch friends and had a great time. 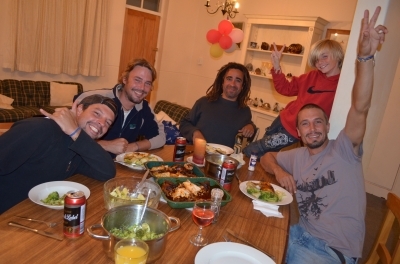 We also had the visit of Kaya, Gustavo's girlfriend, and ''Sid Grilo'', her 9 year old son. 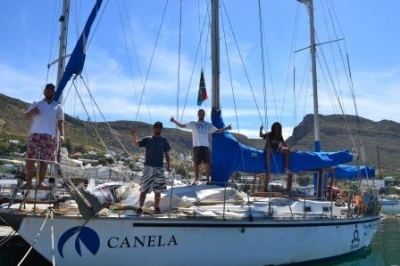 As usual they were great to have around and we are looking forward to have them on the boat again, or maybe at home in Canela. Well, now it's time to prepare. We for the passage and you guys to come for our arriving party in Brazil, on the 15th of december, I wouldnt miss it for anything.